With the weather predicted to be around 40 degrees C for the next three days I think I will be spending most of my time indoors, only coming out to water in the evening. Damn, I forgot that I have a meeting to go to tomorrow so I will have to go out in it after all. I hate the heat so I am glad I live in Southern Victoria but Tas would be even better. 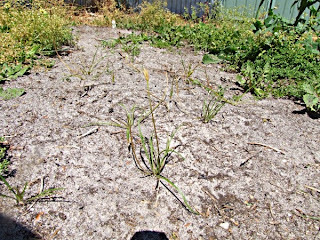 This is part of my yam daisy bed (microceris lanceolata) I have had them in since last winter when I germinated the seed. They are self selecting at the moment which means that any that can't take the same growing conditions as my other vegetables dies. I have about a quarter of the plants left so far. They are still very small and I wonder why they grow so much better in pots than in the ground, after all they are a wild flower native to this area so they should grow better in the ground than in pots. This is my friends raised vegetable bed. It is actually a lot bigger than it looks in this picture. 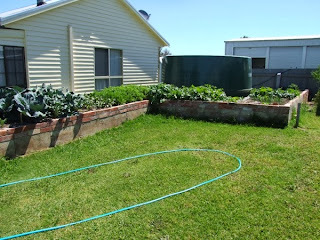 It is waist high and grows all the veg they need just for himself and his wife. I love raised beds, especially for older and infirm people. They are so much easier to handle than growing in the ground with no bending and very little weeding. Water isn't wasted and being easy to garden makes people actually willing to go out and do the work rather than it being just too hard. I think most children should make decent, permanent raised beds for their elderly parents if there is room and they like to garden. It is not that hard - just cement blocks and bricks or boards and some cement and a few hours work, or you can pay someone to do it. The results are always worth it. Coming close to Christmas and with family coming down I may not be posting as much in the next couple of weeks. Don't worry I will still be doing my overview of the year at the end of the month.